29 Oct Congratulations Sue Richey – 40 years of teaching! 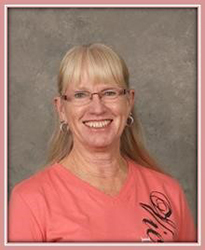 District Administrators, Governing Board members, Marana Schools’ 2340 Foundation members, and school staff recognized Sue Richey for her 40 years of teaching during a surprise celebration on Tuesday, September 30 at Coyote Trail Elementary School. At the celebration, Dr. Wilson presented Ms. Richey with her 40 year longevity pin. This is the first employee in the Marana district to receive this recognition. Ms. Richey also received a cake and flowers. The 2340 Foundation presented her with an appreciation gift. Sue Richey began teaching in the Marana Unified School District in 1975 and the 2014-15 school year marks her 40th year of teaching. She is currently a second grade teacher at Coyote Trail Elementary School. She has also coordinated the after school exercise program, Milers’ Club, for 12 years.